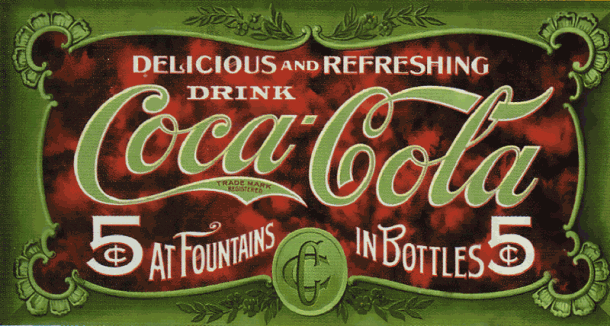 Coca-Cola’s inventor John S. Pemberton was not a shrewd marketer of his drink, and the ownership of Coca-Cola eventually passed to Asa Candler, whose company remains the producer of Coca-Cola today. 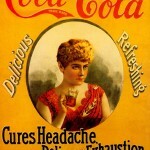 It was Candler’s successful marketing, and continued by successors such as Robert Woodruff, that established Coca-Cola as a major soft drink in the global marketplace. Frank Robinson, Pemberton’s bookkeeper, became Coca-Cola’s first marketing genius in short order, convincing Pemberton of the urgency for advertising the brand, and designing the famous Coca-Cola script and trademark. He pressured Pemberton to engage in lavish advertising promotions, issuing free drink coupons and plastering Atlanta with oil-cloth banners and streetcar signs to promote the brand. The extravagant advertising budget paid rapid dividends, quickly promoting Coca-Cola to become the most popular local beverage of it’s kind.